An oil of HMS Ophir moored off Halifax in Canada sold for a multi-estimate sum at George Kidner’s (19% buyer’s premium) sale in Lymington on March 2. 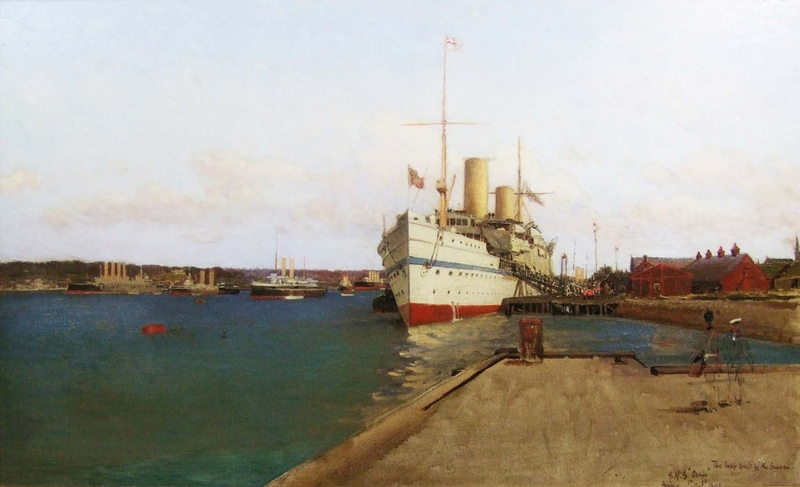 Early 20th century school oil of the HMS Ophir at Halifax – £2600 at George Kidner. The 21½in x 3ft (54 x 92cm) work, which bears no signature, is inscribed The Last Boats of the Season – HMS Ophir, Halifax 5th October 1901. An outline of two figures on the quay to the bottom right, suggests that the painting is unfinished. The Ophir served as the Royal Yacht on a nine-month tour of the British Empire carrying the Duke and Duchess of Cornwall and York, the future King George V and Queen Mary. On the completion of the royal tour in November, HMS Ophir was paid off at Tilbury Docks. She was later converted into an armed merchant cruiser during the First World War and was scrapped in 1922. Against a low estimate of £100, the picture sold for £2600.